Devices with USB port are getting more. You may find the USB port is not enough. So this item can allow you connect 9PIN interface to the USB of the front panel. It is quite convenient. From motherboard 9pin(10pin) USB Internal Header to Dual 9-Pin(10-pin) male USB extension adapter. 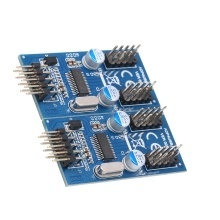 With back glue, it can be directly fixed on the motherboard or chassis firmly. USB cable length is about 30cm/11.81in. 9Pin USB head multiplier Male 1 to 2 / 4 Female Extension Cable Card.